Pink Sugar Bowl: Guest Post from Moore Living! Guest Post from Moore Living! February is already upon us and you had made a vow to yourself to get healthier. You have warned your family they better get ready to eat some new foods, you told your close friends you may not be eating out as much and might be cutting back on the wine. The one thing you are unsure about is how to navigate your local grocery store and you are totally blinded by the amazingness of Whole Foods. You want your food to still taste good and you want to make it fun. Can those two words live together; good and fun, when it comes to eating? I say Of Course! What I love doing with clients is inspiring and empowering them to live their best lives ever and that means eating awesome food. We have to prepare to succeed. 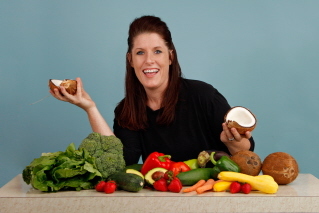 I help you prepare, navigate the super market, cook simple whole food meals, have dinner parties, and pantry clean outs. Have you ever equated what you are eating to why your hormones seem to go crazy and you have PMS every month, or why you have no libido or energy? Do your kids seem to eat whatever and then act like whatever, or you have noticed that in friends children? When you are at the grocery store, you will notice a direct correlation with health and what is in someones cart, and if they seem happy or not. Did you know seaweed tastes super, and that it will help balance your thyroid and digest beans better. Who knew coconut oil was not only for your kitchen. So get on board with your health, I say invest in your health inside in out like you invest in your car. Look at your grocery bill as you financing your dream car, don’t coupon it out. When we feed our body well we cherish the body God has provided us with, we become better partners, friends, and co workers. We naturally attract goodness and abundance through positive thoughts instead of the negative and fear driven choices we make when we are eating junk food. Get your friends together over at your house or schedule a time for us to meet and I will lead you fearlessly through the land of Kale, quinoa and introduce you to some fun things like goji berries, maca, and bee pollen. Moore:Living with Sarah will be your partner inspiring you to be healthy balanced and clean. We offer home cooking parties, grocery store fun, private and group nutrition and lifestyle coaching, and cleansing and detoxing services. Sarah can also speak at your work, school or organization.